Unpredictable weather forced a change in plans announced last week to hike on Nebo Ridge in southeast Brown County. After 12 hours of fallacious forecasts of cloud breaks, I opted instead to continue my closer-to-home photo exploration of the Deam Wilderness. And after days of nonstop rain, I chose to stay on the high ground, specifically the Terrill Ridge Trail that leads north from the Hickory Ridge Lookout Tower. The trail follows a ridge top road to the 19th-century Terrill Cemetery and features two wildlife ponds where I knew, at a minimum, I'd find reflections of the sort I wrote about last week. The road is maintained for family access to the cemetery and, while soggy, was still easily traversed. Along the way I encountered a backpacker who told me of another water hole east of the trail on "county line road," a now overgrown roadway that delineates the boundary between Monroe and Brown Counties. I counted off the 400 paces he advised and found a campsite but no water. Nebo Ridge in Southeast Brown County occupies a special place in my creative history. 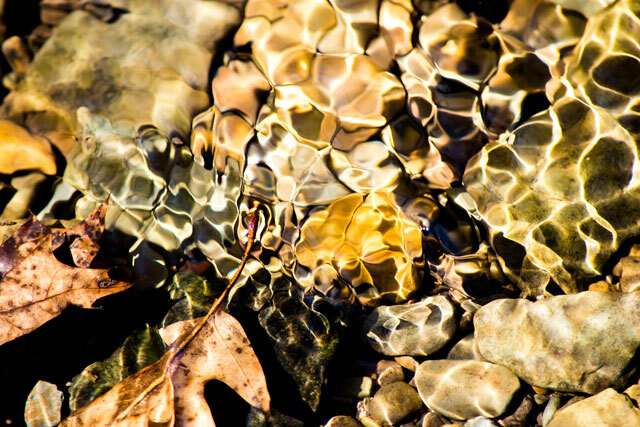 I shot one of my first artistic photos and my very first reflection on a Hoosier National Forest wildlife pond there a little more than 40 years ago. The Indiana Public Interest Research Group (InPIRG) had just proposed the 30,000-acre Nebo Ridge Wilderness Area for inclusion in the National Wilderness System, and a couple friends, my ex Judy and I headed east from Bloomington for a little exploration. I had no idea where we were, other than Nebo, just down the road a piece from Story. That was as deep as I'd ever been in the Southern Indiana wilds at the time. I vaguely remember a gravel road, a steep climb and a trail along the ridge top to the small water hole. 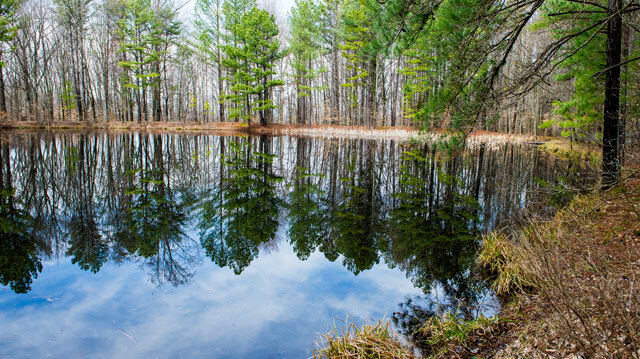 I vividly recall shooting some bare trees reflected on the pond. Four years later, when I typed up my very first serious piece of environmental writing -- on the Hoosier -- I learned the pond was probably built some 40 years prior by the Civilian Conservation Corps, a.k.a. FDR's "tree army." The past month has been anything but enjoyable (or creative). I've fought a viral bug that I thought had disappeared eight days ago, before last week's five-mile trek along the Grubb Ridge Trail wore me out physically. By the time Sunday night music rolled around, I was coughing, running a fever and otherwise unable to participate in the weekly activities at Dave's place. Fortunately, my Honda trunk lid was the only witness to my disagreeable disposition while running unavoidable errands on a cold, gray, blowy Wednesday morning last week. The sun never did show. 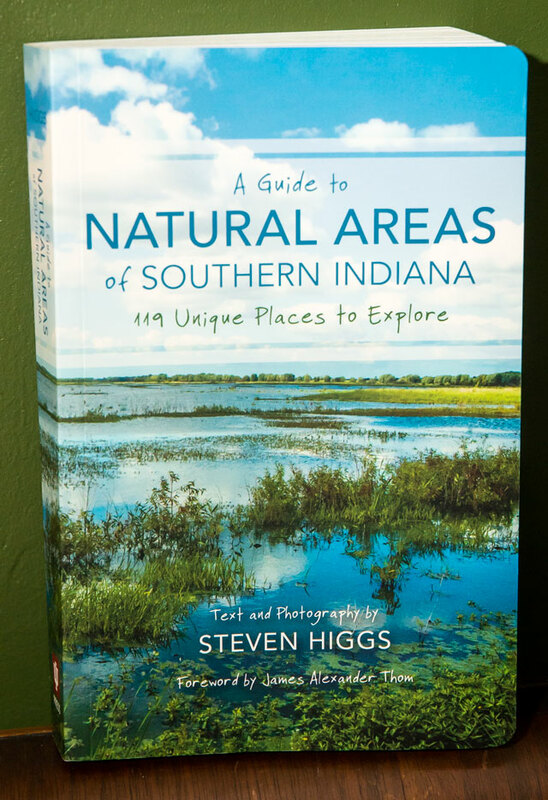 But an email from IU Press that afternoon saying a copy of A Guide to Natural Areas of Southern Indiana awaited me at their front desk served as a mood-altering bolt. I knew when we headed west from the Blackwell Horse Camp on the Grubb Ridge Trail Saturday that any photo ops would most likely be nearly 2.5 miles from the trailhead, in the creek valley, where Grubb meets the Hayes Trail. I wasn't interested in stopping on the first three quarters of a mile or so, which parallels Tower Ridge Road and State Road 446, both of which were humming with traffic on a sunny, 70-degree February day. The sound of rubber on the road isn't my idea of a wilderness experience. And in February, there's just not much color or life in the Southern Indiana woods, except in the seasonal creeks. 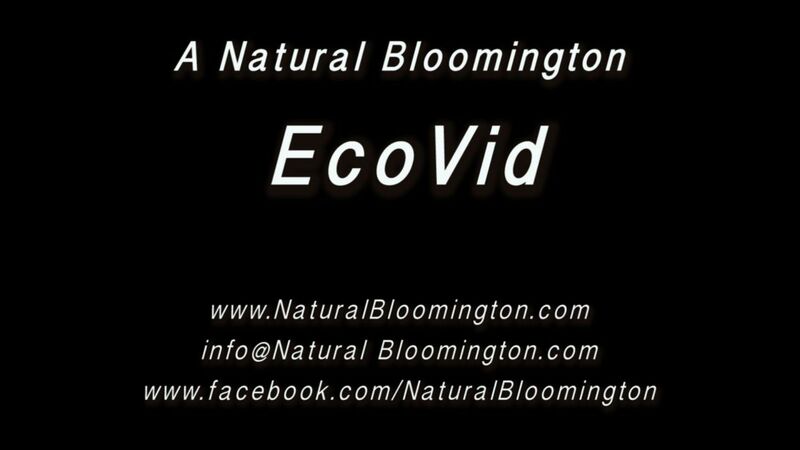 I am pleased to announce that Natural Bloomington is moving into the video age. I've newly revived the Natural Bloomington YouTube Channel and posted an admittedly rookie EcoVid effort from my Jan. 29 hike in the Deam Wilderness. Indeed, it looks like video will be an increasingly prominent tool of creative expression around here, at least for awhile. This 3-minute video from the Deam’s Cope Hollow Trail isn't truly a rookie effort. I've shot, edited and produced digital movie projects before, and my students create slide shows and short videos. Hell, I've even been paid for it. But shooting and producing moving pictures has never really captured my imagination – until now. The Cope Hollow EcoVid is an experiment in every way. It's the first I've shot in motion on the trail, the first captured with my new Nikon D600 body and the first ever edited with Premier Pro. I deleted four worthy minutes of scenery that didn’t pass the experimental tests – blurred images, lens noise, etc. 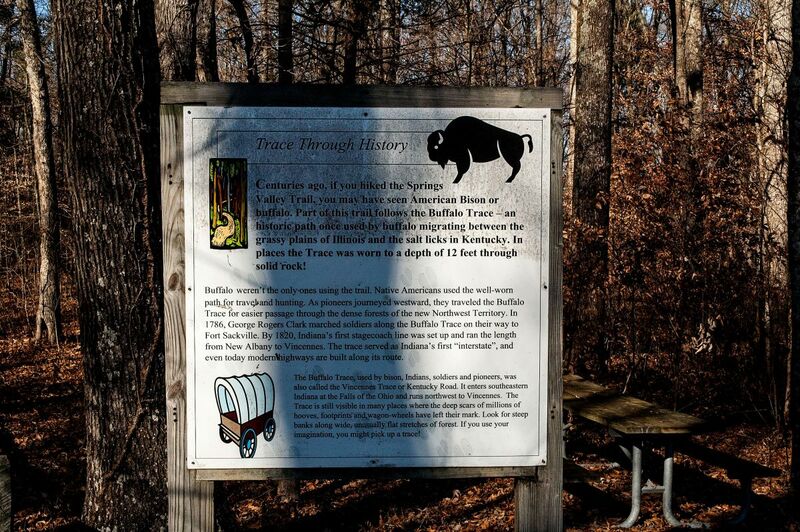 Walking within a half mile of the Buffalo Trace on the Springs Valley Trail a couple weeks ago reminded me that I’ve never quite known when (or if) I’ve walked or driven on the actual ground that massive herds of bison trod through Southern Indiana in pre-White Man days. Native Americans and white settlers for centuries followed the path blazed from New Albany to Vincennes by thousands of bison living between the grasslands and salt licks of Northern Kentucky and the prairies of Western Indiana and Illinois. By 1819, according to U.S. Forest Service, more than 5,000 settlers traversed the trace on their ways west. Explorers Lewis and Clark and Presidents Abraham Lincoln and Benjamin Harrison are known to have traveled on it. I’m pretty sure I have driven on the trace. The mile I drove from State Road 37 in Orange County to the Lick Creek Trailhead on Valeene Road for my upcoming Guide to Southern Indiana Natural Areas is included in the 142-mile Buffalo Trace Loop of roadways designated as an Indiana Historic Pathway. But I am almost certain that I have not walked on it. Loving the Charles C. Deam Wilderness Area -- to death? During the protracted debate over a federal wilderness in Indiana in the late 1970s and early 1980s, one argument against the less-than-13,000-acre Charles C. Deam Wilderness Area was that it wouldn’t be big enough. Situated within a couple hours of Indianapolis, Cincinnati, Louisville and Evansville, Indiana’s green jewel, the argument went, was vulnerable to being loved to death. In the decade before the Deam was dedicated in 1982, environmentalists had proposed wilderness plots ranging between 32,000 acres (Nebo Ridge Wilderness Area, 1973) and 17,000 acres (Salt Creek Compromise, 1979). The last, which would have included sections of the Hoosier on Monroe Lake’s north side in Brown County, was vetoed by the Indiana Department of Natural Resources because it included the Crooked Creek Marshes that the agency manages for duck hunters. Since Congress established the Deam as a federally protected wilderness on Monroe’s south shore, east of State Road 446, their predictions have withstood the test of time. The Orange County woods were the province of the deer hunter on Saturday. It was the first day of shotgun season, and I kept my distance during an afternoon in the Hoosier National Forest five miles or so southwest of Paoli. 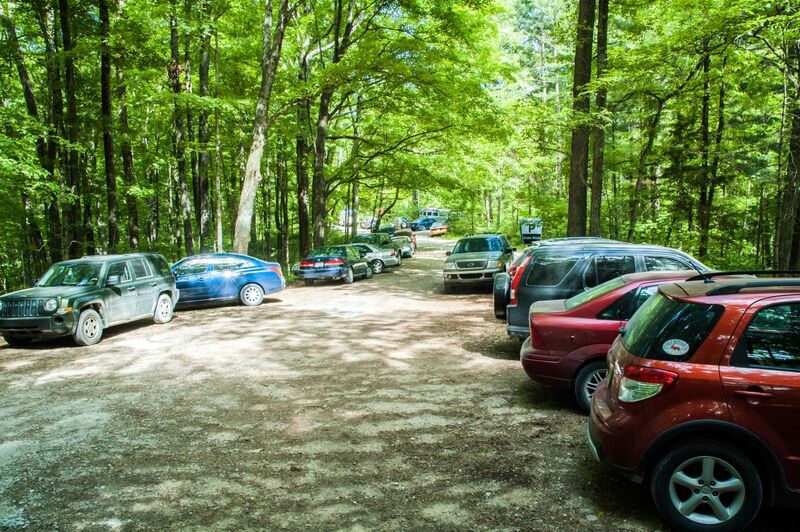 I walked the road by the 141-acre Springs Valley Lake between the campground and boat ramp. And I ventured a couple hundred yards or so on the Springs Valley Trail, clad in my blaze-orange jacket, of course. I suggested to a father-son pair, who had canoed across the lake in search of the elusive white tail with no success, that they should come to Bloomington, where, on a weekly basis, I see up to five at a time in my back yard in the Bryan Park Neighborhood. I also learned that hunters wheel their take out of the woods. They don't drag it. Another is that that I've explored neither the stretch of Grubb Ridge Trail in the Deam Wilderness due east of the Blackwell Horse Camp nor the Hickory Ridge Trail at the Hickory Ridge Horse Camp, both situated in the back country where Monroe, Lawrence and Jackson Counties meet. Back in 1980, when I hiked what was then called the Hickory Ridge Hiking Trail through the Deam, the northern stretch followed a much different path. Yet another is they're both part of the Hoosier National Forest, the focus of my latest book project, envisioned as a coffee table book at this early stage titled, simply, The Hoosier. The days when Hoosier National Forest timber gleamed supreme in the eyes of U.S. Forest Service land managers seem to have been relegated to the fading pages of history. But when timber barons in Bedford did call the shots, they envisioned chainsaws everywhere.